The magician shows a wand from which hangs the pompom and says that the red ones are the most magical. Said that, he passes the wand behind his back and the red pompom move from one end to another. Then, he repeats the same moves and makes them return to the starting point. For the audience is obvious that the magician changes the place to the pompom by turning the wand behind his back. 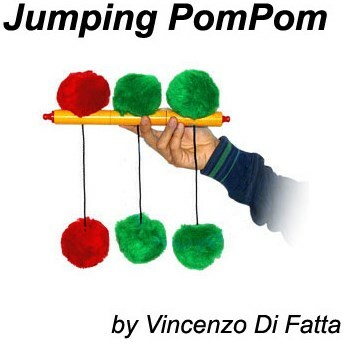 So he leaves everyone astonished by making the red pompom arrive in the middle of the wand! The wand measures about 12" (30 cm). Easy to use, entertains children and adults.